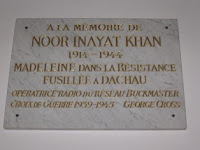 A small plaque in the Memorial Hall at Dachau bears the name of the brave Indian Muslim woman Noor Inayat Khan, who was shot in the head at Dachau Concentration Camp on 13th September 1944. The life of this brave young woman and her contribution to the Allied effort to defeat the Nazi regime is something admirable. Noor was of Indian Sufi origin. She was born to Hazrat Inayat Khan, the great grandson of Tipu Sultan. He lived with his family in Europe, as a musician and teacher of Sufism. He married Ora Baker of Albuquerque, New Mexico, who was also a Sufi. During World War I, he moved his family to London and lived in Bloomsbury. But in 1920, the family was back in France and settled down in Suresnes near Paris. Noor had an excellent education. She studied Child Psychology at Sorbonne and Music at the Paris Conservatory. When her father died in 1927, she had the responsibility of caring for her mother and siblings. She started writing poetry and short stories for children which were published regularly in children’s magazines and French radio. Her book of short stories for children titled “Twenty Jataka Stories” was published in London in 1939. After the start of World War II when the Germans overran Paris in June 1940, the family had once again to flee to London.Even though she was a Sufi and a pacifist by nature, she along with her brother, decided to join the British in their war against the Nazis. In 1940, Noor enrolled in the Women’s Auxiliary Air Force in the rank of Aircraft Woman, IInd Class. Later in 1941, she was recruited to the Special Operations Executive (SOE) in France.She received intensive training at the Special Operations Executive Schools and was posted in the Air Ministry as a wireless operator. Because of her fluency in French and her professional competence, she was transfered to the Directorate of Air Intelligence and sent to Nazi occupied France. 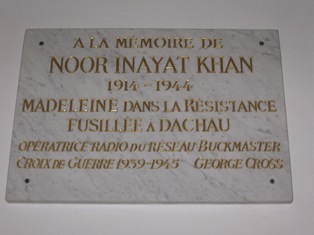 Noor who called herself Nora Baker, worked in a group called the Physicians Network Radio Operators. It was a hazardous job and many of her colleagues were arrested by the Germans. Noor was given the choice of going back to Britain. But she opted to stay on in France and continued to remain the link between London and Paris. It was a dangerous mission, but she stoutly continued her wireless transmissions in spite of having to move from place to place. Tragically, Khan was betrayed by her own SOE officer Henri Dericourt, who was a double agent for the Abwehr. On October 13th, 1943, she was arrested and interrogated at S.D. headquarters. Noor would not give them any information about the nature of her work or about her colleagues. They named her ‘dangerous prisoner.’ She tried to escape twice during this period. Hans Kieffer the head of the Gestapo in Paris said she gave them false information and lied consistently. But the S.D. discovered one of her note books. Contrary to service regulations, Noor had kept a record of messages sent to SOE operations in code. But the enemy could decode enough of these, to be able to send messages to Britin in her name. London failed to investigate the anamolies in these messages and considered them authentic. On November 25th 1943, Noor once again tried to escape from S.D. headquarters with two of her colleagues by climbing on the roof. They were caught. Noor refused to sign a declaration promising not to attempt escape in the future. Noor was the first enemy agent of SOE to be sent to Germany from France. For a while she was kept at Karlshrue, then transfered to the camp at Pforzhiem where she was handcuffed and in solitary confinement for 10 months. Labelled as ‘highly dangerous,’ the Gestapo could not break her. She gave no information about her work or her fellow operatives. 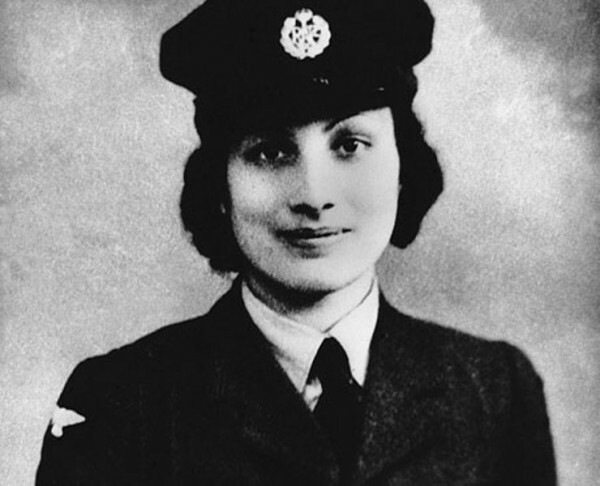 On 11thSeptember 1944, Noor whose code name was ‘Madelaine,’ was sent to Dachau with eight other female operatives. She was shot in the head on 13th September 1944. Other prisoners testified that she was severely tortured before execution. Her body was then burned in the crematorium. Noor died with the words ‘Liberte’ on her lips. She was just 30 years old, an Indian Muslim woman who showed exemplary moral and physical courage in one year of active service as a wireless operator. Britain awarded her the George Cross posthumously. France followed by honouring her with the French Croix de Guerre and Golden Star. Noor Inayat Khan's personal pistol M1907is on public display at the Imperial War Museum North in Manchester. Noor Inayat Khan's personal pistol M1907 is on public display at the Imperial War Museum North in Manchester.